This is going to be the shortest DVD review I’ve ever written, and I’m sure you’ll be able to guess why. That’s right—this movie disappointed me, big time. Apparently on such a huge level this is all I could come up with for a review of it. At any rate, Trick ‘r’ Treat (2007) still remains in the number one spot when it comes to horror anthologies revolving around Halloween, and now that I think about it Tales Of Halloween and Trick ‘r’ Treat are the only horror anthologies in existence about terror on Halloween. I can’t think of any others than these two. When I first heard of this flick I had high hopes for it, but there are two problems, in my opinion, that sink it: the sheer number of tales (ten in all) and the fact that I found the majority of these short films (roughly ten minutes each) to be utterly uninteresting. The first one, Sweet Tooth (directed by Dave Parker), The Night Billy Raised Hell (directed by Darren Lynn Bouseman) and the final one, Bad Seed (directed by Neil Marshall), were the only ones I was entertained by. Bad Seed, in fact, was the best of these three. The rest were hit or miss, with an emphasis on miss. Friday The 31st was the worst of all of them. I don’t know why it was decided to cram this many tales into a ninety-minute feature and expect it all to be entertaining. The best anthologies don’t have nearly this many, and when I heard they were doing this I half wondered if someone wanted to outdo Trick ‘r’ Treat and came to the conclusion the best way to do that might be jack their movie up on steroids, so-to-speak. If that was indeed the motive, it didn’t work. The linking thread between them wasn’t all that interesting either. Adrienne Barbeau plays an unseen disc jockey who weighs in with her two cents every so often, and the original Night Of The Living Dead is playing on various televisions in certain tales to give you that vibe all these stories are happening in the same general locale. There’s also a couple of kids from one tale seen in another. 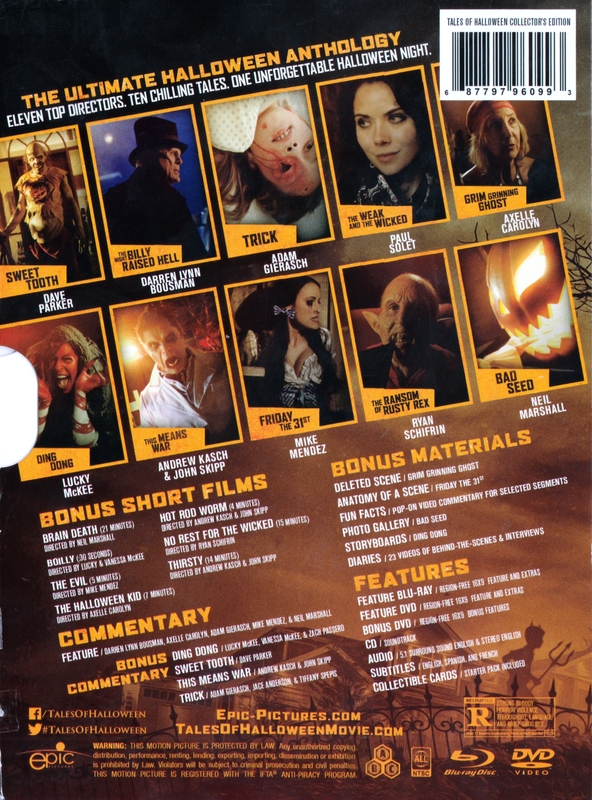 Trick ‘r’ Treat did their anthology linking much better, like master tactician better. There was one other clever one, I’ll admit, and it had to do with murderous trick or treaters who had it in for this one particular family, with the twist being the family were psychos who were torturing and killing kids. I think John Landis was in one of them. No dialogue. His kid is actually some kind of demon and these kidnappers kidnap him hoping to use him for ransom. Most as I mentioned did nothing for me. Examples of which follow: There’s a weird pseudo wild west short with an okay looking demon. There’s another weird one about the witch from Hansel & Gretel . . . I didn’t quite get that one. Grim Grinning Ghost had the most cameos with Mick Garris, Lin Shaye, Barbara Crampton and Stuart Gordon. They’re all dressed up in costumes, with the latter two being unrecognizable. Though Gordon looked familiar. Didn’t know the witch was Crampton until the credits. On the plus side, for those who did enjoy it Epic Pictures has put together a deluxe limited edition (limited to only 1000 units) that can only be bought here. If you’re in the UK Arrow Video has announced they’ll be putting it out, but it won’t be as loaded as the US version is with extras. And I believe there’s a German version which duplicates the US one. Video/Audio/Subtitles: 1080p 2.39:1 high definition widescreen—2.0 English Dolby Stereo, 5.1 English Dolby Digital, 5.1 English DTS-HD Master Audio—English, French, Spanish subs. 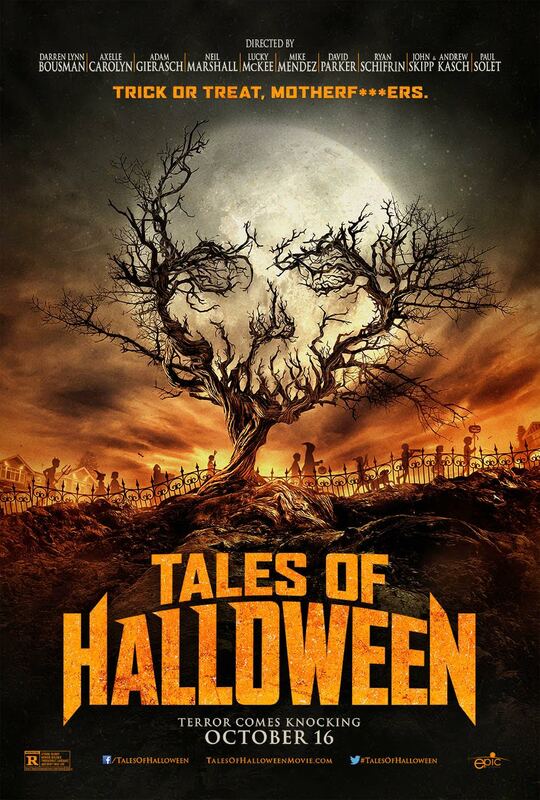 According to Tales Of Halloween’s Facebook page they have no plans at the moment to do a sequel. If they did, I’d recommend not jacking it up on steroids again. 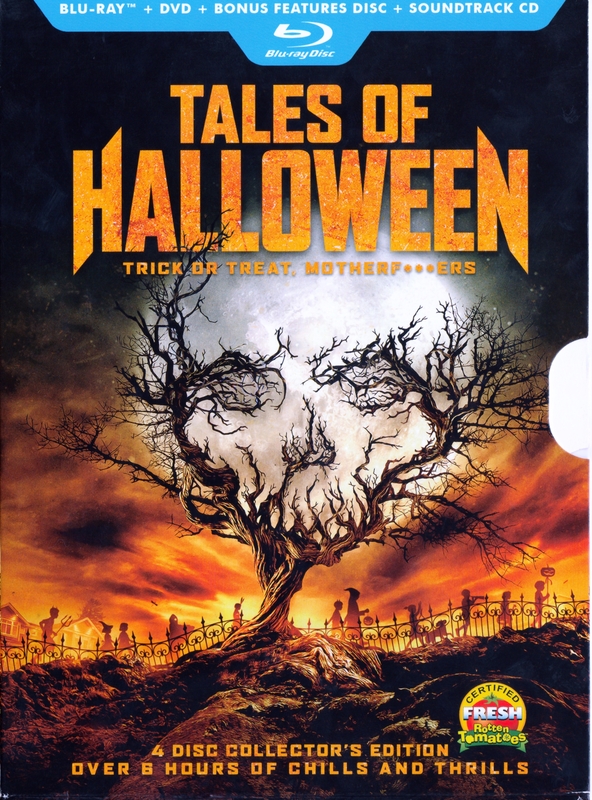 Gallery | This entry was posted in Tales Of Halloween (2016) Blu-ray/DVD/Bonus Features Disc/Soundtrack CD (U.S. Limited Edition). Bookmark the permalink.